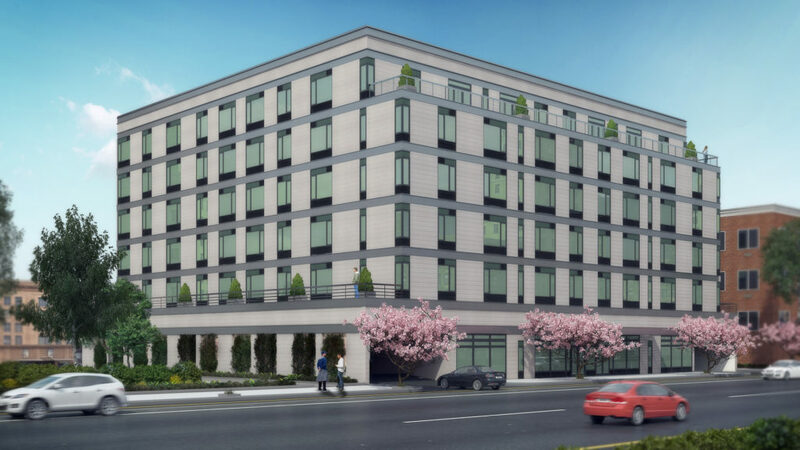 A rendering of the “Millennia” residential development in New Rochelle, which will feature 110 rental apartment units. New Rochelle Mayor Noam Bramson, along with officials from the New Rochelle Industrial Development Agency, the Community Preservation Corporation, and Tompkins Mahopac Bank, joined with developer Tony Hammel, CEO of ELD Properties, Inc. to mark the groundbreaking of the new $30-million, 110-unit multifamily development in downtown New Rochelle. The ceremony also marked the official opening of Burling Plaza, a new community greenspace at the corner of Burling Lane and North Avenue in New Rochelle. The Millennia is the third of seven planned residential properties in the city by ELD. A total of 10% of the units in the Millennia will be affordable to low-income families. Situated one block away from The Millennia at the corner of North Avenue, Burling Plaza is the Downtown’s newest open space. The plaza includes one of three sculptures commissioned through the Mahlstedt Gallery for the city’s central gateway, created by local artists Bob Perucci and Jake Genovesi. Also in the plaza is a solar-powered Soofa bench. The Millennia NR, LLC will oversee general maintenance of the plaza. Completion and tenancy for the new development project are planned for the fourth quarter of 2018. New Rochelle’s Development Commissioner Luiz Aragon noted that the downtown redevelopment initiative involves the rezoning of 279 acres of land and is one of the most ambitious programs in the region and is expected to attract more than $4 billion in new investment to the downtown area. The Community Preservation Corporation, with participant lender Tompkins Mahopac Bank provided a $27 million construction and permanent loan for the Millennia. The Millennia continues CPC’s commitment to working with the city to invest in the resurgence of Downtown New Rochelle. Since 1994, CPC has helped finance more than 50 multifamily housing projects with more than 1,100 units in New Rochelle.